When I mentioned this to my wife, she was incredibly disappointed that a taser was used. She believes it’s up to the players to dole out vigilante justice. Have the outfielder treat any invaders like Nolan Ryan taking care of Robin Ventura. Let’s see these athletes LAY SOMEONE THE F OUT! Granted, most baseball players are pussies (see -Rod, A) but there’s some, such as the Devil Rays, that would LOVE to lay someone out themselves. You bring up a point that I meant to add but forgot. 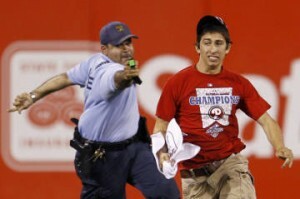 Security guards are one thing, but when a player takes down a random yahoo, the entertainment value doubles!